Children treading mud at the roundhouse open day. 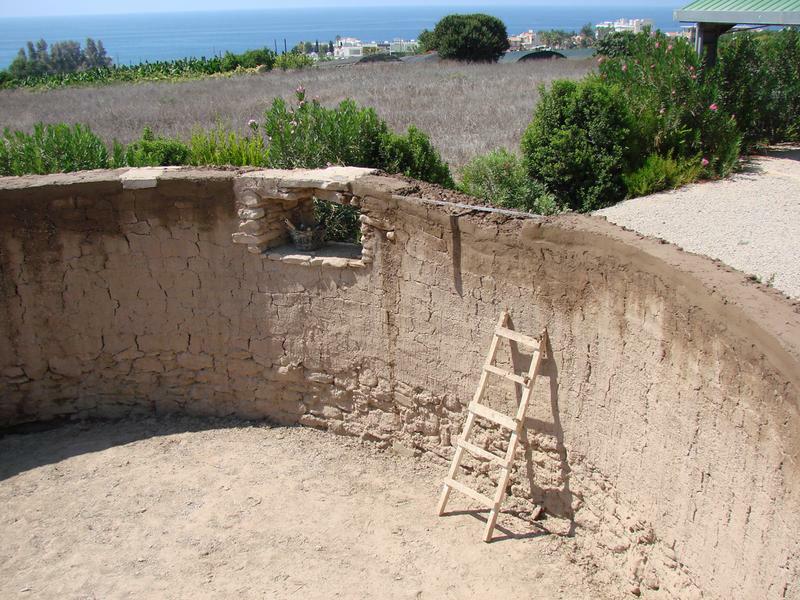 Since reporting to the AIA in June 2010, we have made an impressive amount of progress towards the goal of building a replica of a Chalcolithic roundhouse within the roofed and fenced visitor area of the site of Kissonerga-Mosphilia near Paphos. 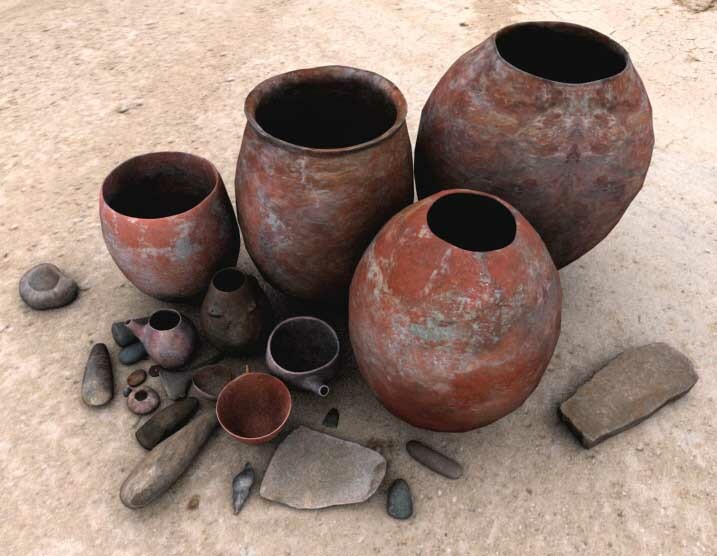 The site was excavated by Professor Edgar Peltenburg of the University of Edinburgh from 1979–92 and is one of the largest and most important Chalcolithic settlements on the island, with preserved structures dating from around 4000–2400 BC. 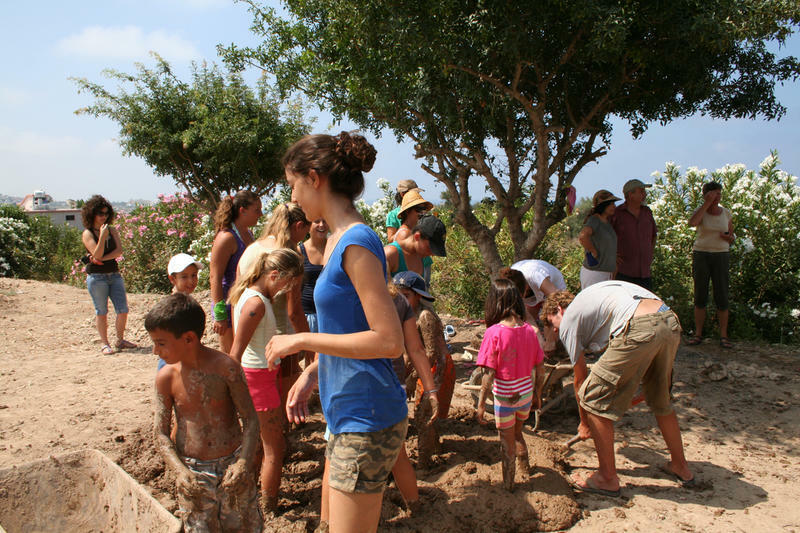 The impetus behind the project is to increase understanding and appreciation of Cypriot prehistory and to raise awareness of cultural heritage issues through employing tourism and educational tools to integrate the archaeology into an accessible narrative—the story of the communities of Kissonerga over the 10,000-year occupation span of the village. The physical building reconstruction, using experimental archaeological and traditional techniques, was funded by the A.G. Leventis Foundation, the Department of Antiquities of Cyprus and the Kissonerga Village Council. Paul Croft (University of Edinburgh and the Lemba Archaeological Research Centre) has been working on the reconstruction since March with the assistance of archaeology undergraduates from universities around the world and volunteers from the Paphos area, particularly from the Paphos U3A group. We are extremely appreciative of all the hard work that the students and volunteers have put into the project. A crucial component is the creation of a sophisticated 3-D computer rendering of the building with all the finds in situ to accompany and enhance the physical replica. It is this additional element that will allow us to widely disseminate the project via the internet and through museums and schools. We are grateful to the AIA for funding this component, along with costs towards filming the process and providing refreshments for a working bee open day to involve the village which we held on Sunday, July 18. The open day was a great success, thanks also to the Kissonerga Village council who distributed our bilingual leaflets and publicized the event widely within the village. Croft and the students had prepared mud piles for treading and a barrow of pre-mixed mud and seaweed construction mixture so visitors could have a go at slapping mud on the walls. Making mud walls vertical and smooth is not as easy as you might imagine! Over the morning we had around 70 visitors, including local families and tourists. You can see in the photographs that everyone very much enjoyed the experience, particularly playing in the mud. The most important outcome will be if the children who participated on the day remember the experience in years to come and feel that they contributed to the project and that the building belongs to them. You can also see in the accompanying photographs that the mud walls of the building have now reached their full height. In order to ensure that the large color posters providing explanatory text and computer imagery, which we will affix to the interior walls, are viewable Croft has constructed narrow window slits around the upper walls to allow natural light into the building. The final stage will be the construction of the roof (both physical and computer-based), the mud rendering of the walls and building a wooden door. Croft is currently insect-proofing the timbers and will build the flat roof from beams and earth filling over the coming months. The computer designer, Matthew Dalton, will render the roof with the aid of photographs and the project will be complete. Film footage taken over spring and summer will be integrated with still digital photographs to provide a complete record of the process. Once editing is complete, the images will be linked to the websites of the British Museum and the Manchester Museum and form a valuable education and outreach tool. Construction is completed at Kissonerga! Read about the process and the end result. 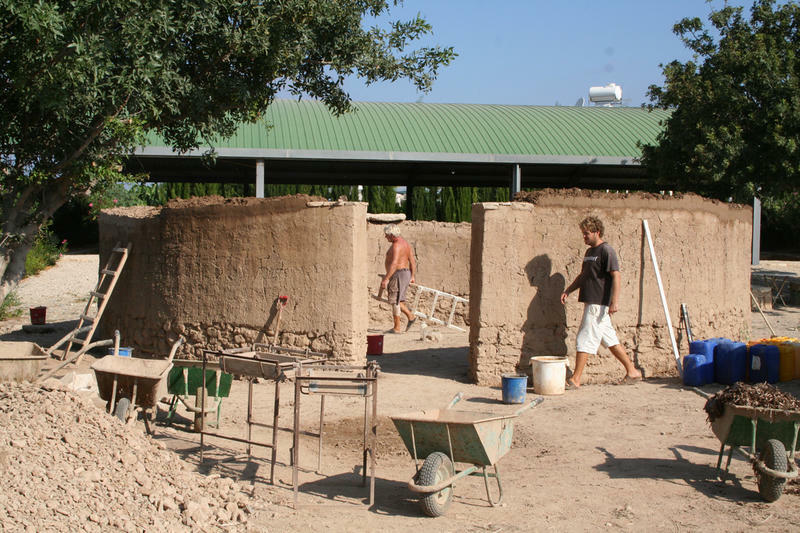 An update from Lindy Crewe about the AIA Site Preservation Grant awarded to Kissonerga, Cyprus.